For most companies, it’s not a piece of equipment, a commercial property or stockpile of inventory. It’s “intellectual capital” – namely the ideas, inventions and information that represent much of the value of modern businesses. The Canadian intellectual property law firm Ridout & Maybee LLP recently prepared a guide for using patents, trademarks and other intellectual property to capture the full value of a business’s intellectual capital. How to select and protect a trademark. For CFOs and their teams, budgeting, forecasting and financial planning can be akin to pulling teeth. It’s a painful process, and one that’s been slow to adapt to new advances in technology. 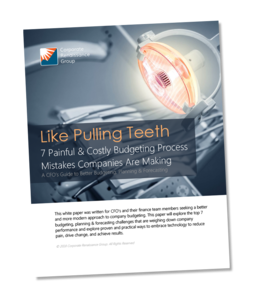 Corporate Renaissance Group, a leading Canadian financial and technology consulting firm, recently released its guide for how to avoid painful – and often costly – missteps corporate budgeting process. Tips for streamlining the data collection process.